I’ve had an interesting year at work so far. One of the admin assistants has been of particular help over the last couple of months, so I decided to make her a small gift to say thank you. Having sat at her desk for two weeks, I knew her favorite color was purple and I knew that I had some purple yarn in my collection. Every year, my work place has a theme for our peak season. This year the theme was a country-western one. 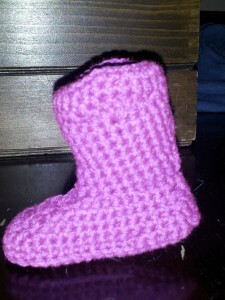 After a bit a searching, I found a pattern for a small crocheted cowboy boot and decided that it would make a good thank you. The pattern looks a little more like an actual cowboy boot if you use two different colors and add the suggested decorations, but I only had one color of purple, so I just did the whole thing in that color. Overall I was pretty happy with how quickly it worked up and how it turned out. And the lady I was gifting it two was very happy with the addition to her collection of purple decorations! I would certainly do this pattern again for other occasions. It was relatively simple and quick and the outcome was close enough to the picture on the pattern to make me happy.